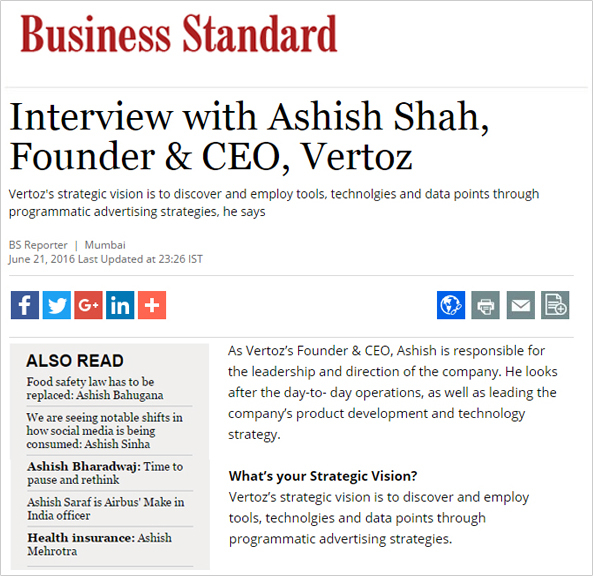 Business standard interview with Vertoz’s CEO and Founder. This article talks about company’s past and the upcoming strategic developments and expansions. Digital ad spends in India is rising year on year at a rapid rate, hence, creating more and more opportunities for the ad tech companies to flourish. With the growing economy along with the startup initiatives introduced by the Government, India is rapidly picking up pace. We at Vertoz, plan to scale up our offerings by partnering with large SSPs and DSPs worldwide to increase fills and earnings for publishers and advertisers respectively. It is the online property of Business Standard Private Limited, publisher of India’s leading business daily, Business Standard. The website attracts over 5 million unique visitors every month, the highest such number for any standalone business newspaper website in India. Vertoz is among the best display ad networks for the publishers. We build our own technology that helps us to provide services and solutions to our valued customers. We are among the leading programmatic companies. We offer engaging and innovative advertising and monetization solutions for our customers. Our ingenious platform, proprietary technology and advanced capabilities empower a global roster of top advertisers and publishers all under one roof.